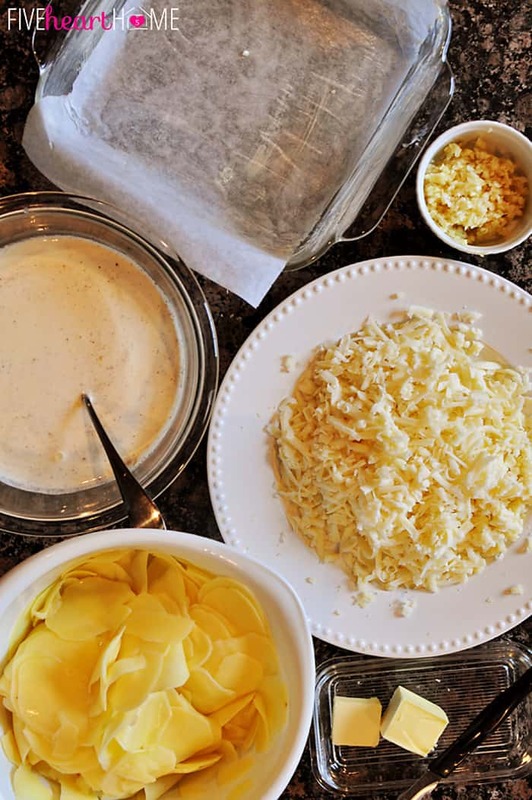 Thinly sliced potatoes are layered with garlic and Gruyère cheese, drenched in cream, then baked, overturned, and sliced for an elegant presentation that’s perfect for special occasions and holiday dinners! Well, we’re midway through December and my Christmas to-do list is still a mile long. (Please tell me I’m not alone. I’m not alone. Right?) But one thing that I have checked off my list is deciding on our Christmas dinner menu, and today I’m going to share with you the starring side dish. These aren’t your ordinary scalloped potatoes, folks. No sirree. 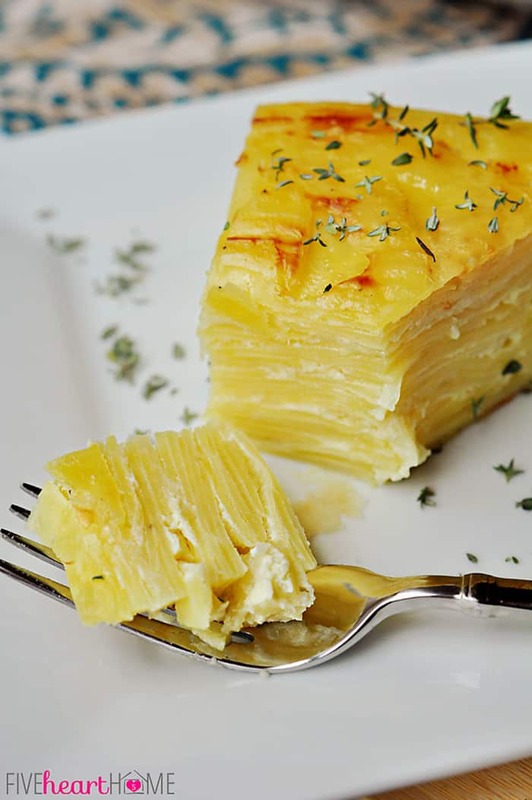 Paper thin potatoes are layered with minced garlic and flavorful Gruyère cheese before being doused with a cream-laden custard. The dish is then baked until golden and bubbly. But the real magic happens when your otherwise ordinary-looking scalloped potatoes are overturned (hence, the “flan” portion of the title) and sliced before serving. Truly, how beautiful would this potato dish look on your holiday table? It’s perfect for any special occasion, or it has the ability to elevate an everyday dinner from ordinary to extraordinary. 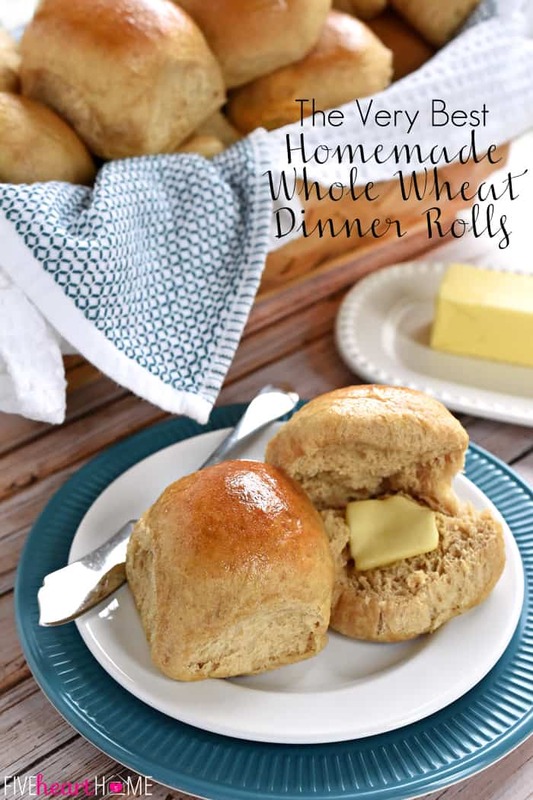 Though it takes a bit of time to bake, there is nothing complicated or difficult about this recipe. The ingredients are simple and the preparation is straightforward, but the presentation and flavor will earn this dish a spot in your favorite recipe file. It’s been in mine for a number of years now, and each time I fix it, we all marvel at how tasty it is. And now for a few pointers. First off, this recipe is particularly amazing when the potatoes are sliced as thinly as possible. That takes forever with a knife and it’s difficult to get the potatoes uniformly thin (at least for me), so I find a mandoline slicer to be invaluable when making this dish. This recipe was created to be baked in an 8- by 8-inch dish, and if you use exactly 3 pounds of potatoes, the ingredients will go all the way to the top of your dish but should not overflow. However, it might not be a bad idea to put a sheet pan under your baking dish, just in case there’s any overflow. 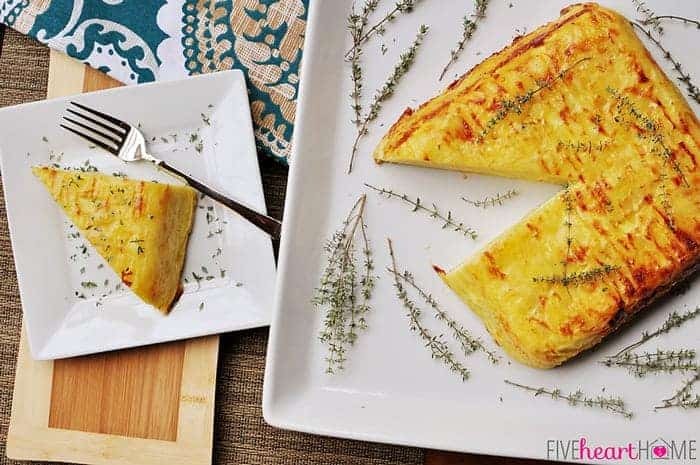 Lining your dish with parchment paper ensures that your potatoes will come out like a true flan once overturned, so I wouldn’t recommend skipping it. If you’re feeling adventurous, feel free to sprinkle some fresh chopped herbs in between the potato layers (thyme would be delicious! ), or even some crispy, crumbled bacon. Yum. I think these potatoes would be lovely alongside just about any holiday dinner entree, from beef tenderloin to clove-studded ham to crown roast of lamb to Christmas goose! 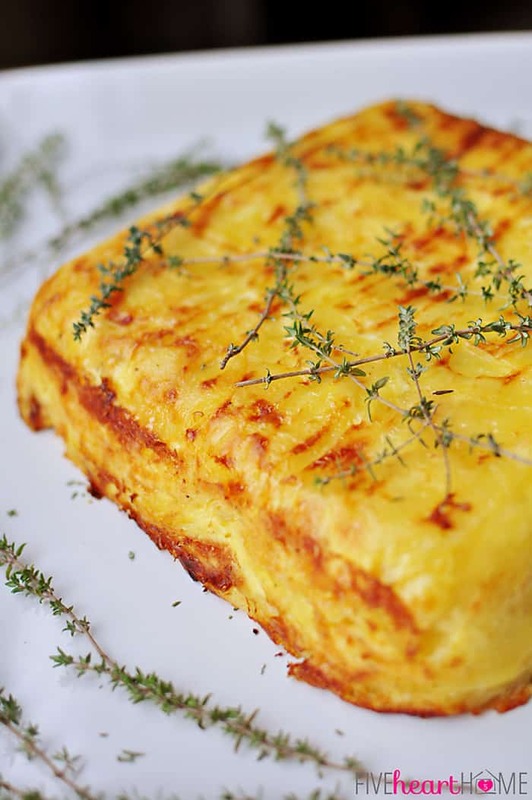 Whatever it accompanies, just beware that this scalloped potato flan might very well overshadow the main course and become the star of the show. Luckily, it’s so darn delicious that nobody will even mind. 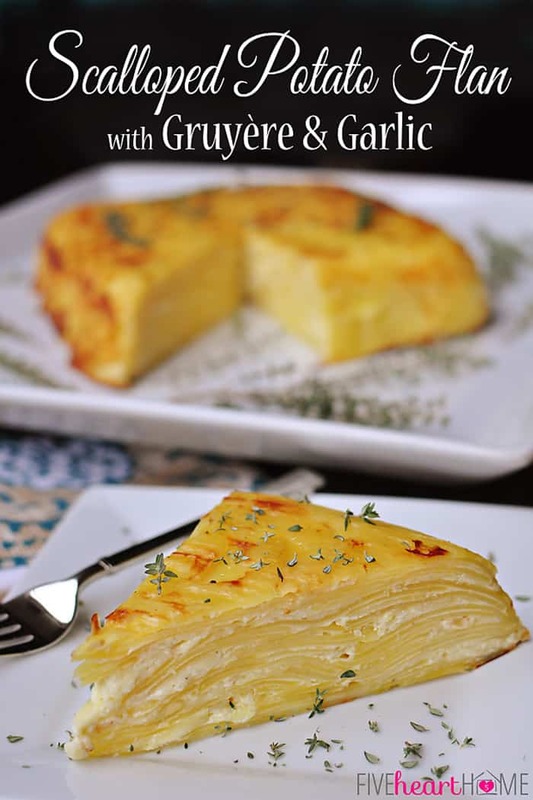 Thinly sliced potatoes are layered with garlic and Gruyère cheese, drenched in cream, then baked, overturned, and sliced for an elegant presentation that's perfect for special occasions and holiday dinners! Prepare an 8- by 8- by 2-inch baking dish by greasing it with butter and lining it with parchment paper. In a large bowl, beat eggs. Whisk in cream, kosher salt, pepper, and nutmeg. Set aside. Lay the potatoes in overlapping rows until the bottom of the dish is completely covered. Sprinkle with a little bit of minced garlic and a handful of grated cheese. Repeat layers about halfway up the side of the dish. Pour half of the cream mixture over the potatoes, alternately lifting up the layers with a fork and then pressing down to ensure that the cream gets in between all of the layers. Repeat layering potatoes, garlic, and cheese until it's all used up and you reach the top of the dish. Pour the rest of the cream mixture over the potatoes, once again lifting and pressing on the potato layers to make sure that there are not dry spots. Cover the dish with aluminum foil and bake for 1 1/2 hours. 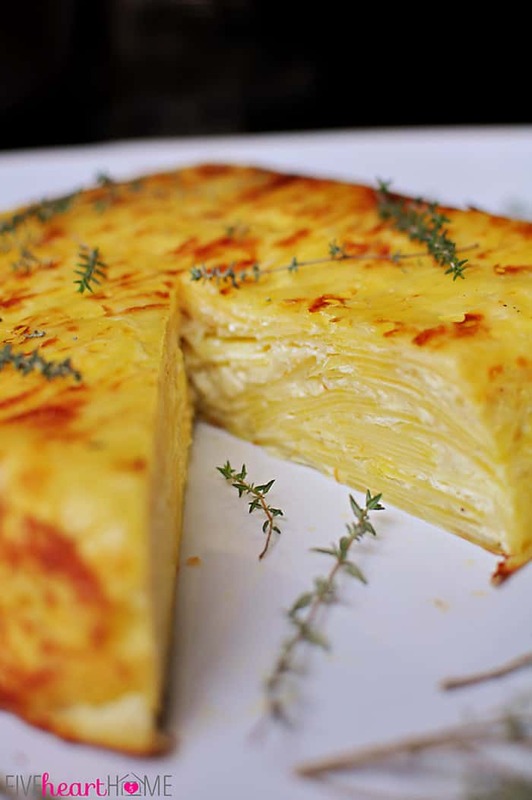 Remove the foil and bake for an additional 15 to 20 minutes, or until top is golden brown and potatoes in the center of the dish are tender when pierced with a small knife. Remove the flan to a wire rack and allow to cool for 15 minutes before placing a platter over the top of the dish. Carefully overturn the flan onto the platter and slice into serving-sized portions. Serve warm. I cut the parchment paper to the width of the dish and then lay it so that it covers the bottom and goes up two sides. I make sure that the other two unlined sides are generously greased with butter, and I run a knife along their edges after the potatoes come out of the oven and again before overturning the dish, just to make sure there's no sticking where the parchment paper is missing. If you use more than 3 pounds of potatoes, all of the ingredients will not fit in an 8- by 8-inch dish. If you use a larger dish, you may have to adjust the cooking time accordingly if your layer of potatoes ends up being thicker or thinner than usual. Garlic is a prominent flavor in this dish, so feel free to use less than more, if you prefer a milder garlic flavor. 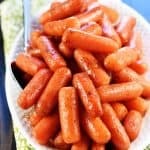 This recipe has never overflowed for me, but it does go all the way to the top, so use a baking sheet under your dish in the oven if you're concerned about potential spills. You may slice this flan into wedges or squares. 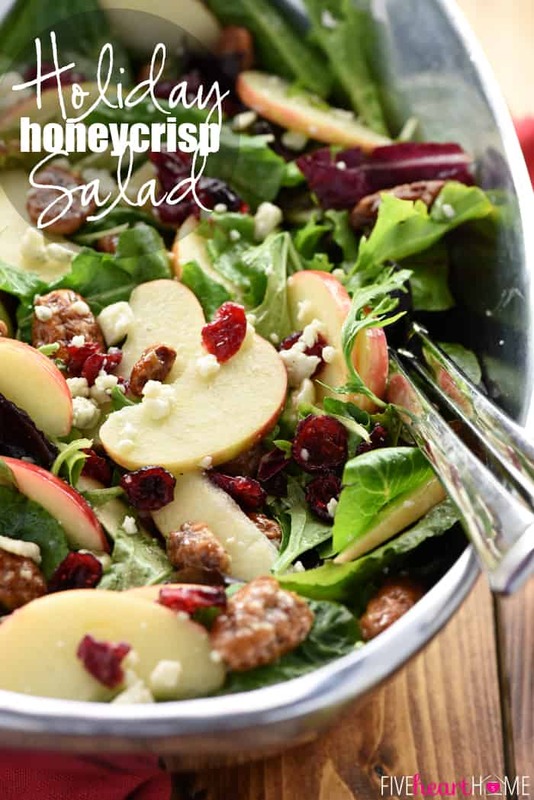 If you want to make this dish ahead of time, individual portions may be reheated in a 400°F oven for 10 to 15 minutes. ***EDITED 4/12/14 to change Kosher salt to regular salt or sea salt (to reduce any confusion in trying to convert amounts) and to reduce overall amount of salt used (since everyone's tastes vary and you can always add more salt to the final dish but it's impossible to take it away). Adapted from a recipe that I wrote down about 10 years ago after finding it online. I am almost positive that it came from the Epicurious site, but I have searched for the original recipe to no avail. Thank you, Cindy! This dish does make for a very pretty presentation, but honestly? It’s deceptively easy to make. 🙂 Thanks so much for the sweet comment and the pin! This is 100% being added to our dinner menu, we’re going to have a great upcoming meal! Thanks in advance! I’m so happy to hear it, Pamela…I hope you all enjoy it! Thanks for stopping by! Oh this looks so delicious! And it looks so beautiful with all the thin layers of potato! 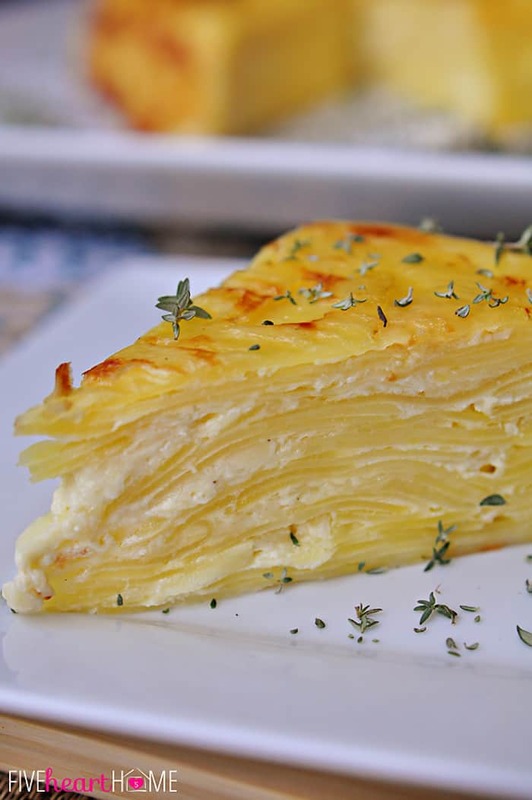 I agree, Maria…I love the way the thin layers of potato look when you cut into it. 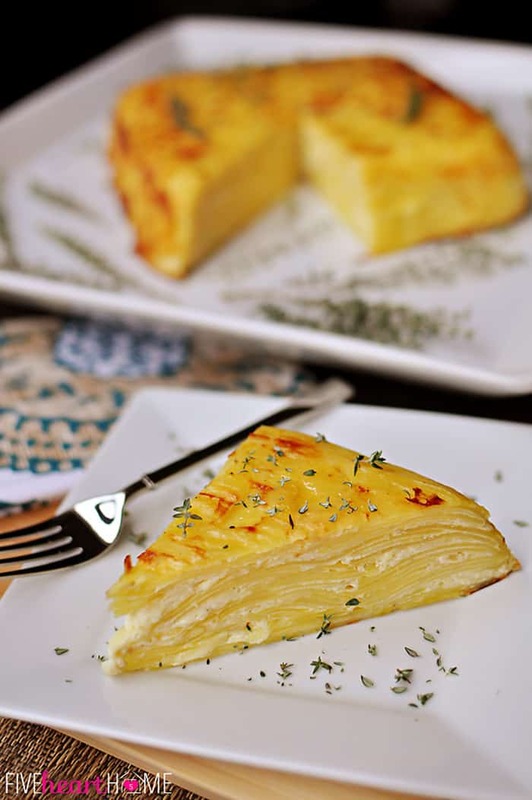 It’s definitely a fun twist on scalloped potatoes! This is beyond gorgeous. And dangerous! I’d eat it all! Oh, this looks like a dish I would truly enjoy!! It looks simply delicious!! I am going to have to try this!!! Thank you for sharing!! I bet that yours will turn out just perfect, Shamene! If it makes you feel any better, my cakes will never be as pretty as yours… 😉 Hope you enjoy this one, whether you make it on Christmas or another day! Oh my heck! This looks AMAZING! I cannot wait to try this! -Trying to cut down on salt in our food and this was very salty, even with the kosher salt, so I’ll be using less, maybe 1 tsp. -Only had 2 T of garlic, and that was enough to make it very garlicky. -Used a knife to slice my potatoes so they weren’t as beautifully thin as yours; I’ll have to drag out my mandoline next time. That also might account for all the pepper sinking to the bottom, larger gaps between potatoes! -Used a 9 1/2 x 7 1/2 x 3 dish (are you supposed to measure across the top or bottom edges? ), or 2.75 quarts, and it worked perfectly, no worries about spilling. Thanks for this recipe. Your presentation is beautiful! Thanks so much for the thoughtful and thorough comment, Julie! I’m glad you enjoyed this and I appreciate you sharing your adaptations. I’ve been thinking about the use of Kosher salt since reading your comment, and I’m afraid that some people might try to substitute it equally not realizing that regular salt is more concentrated. So I went ahead and changed the recipe to call for regular or sea salt instead of Kosher. I also reduced the called-for amount of salt in general because I’d rather have it slightly undersalted than oversalted…you can always add more but it’s impossible to take it away! So thank you for your input! 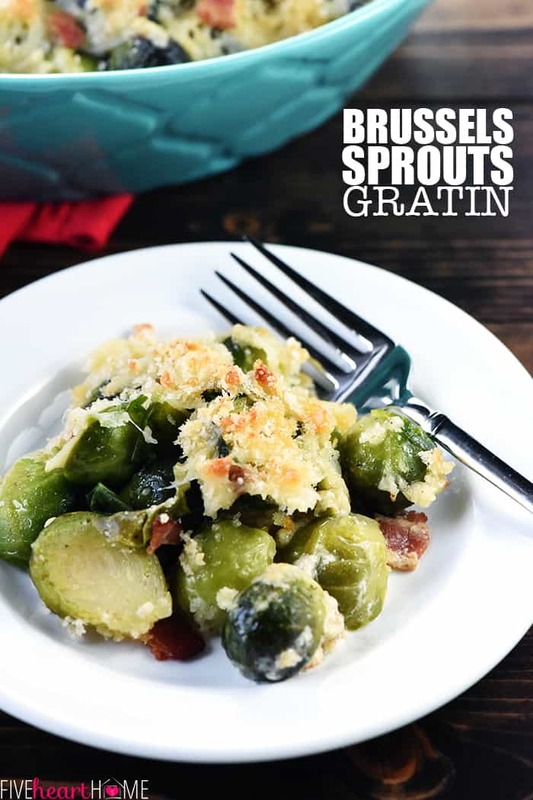 I did originally note that garlic is a predominant flavor in this recipe, and while my family loves garlic, I’ve noticed that the intensity of the garlic in this recipe does increase over time, so leftovers become even more garlicky. I’m glad 2 tablespoons was the right amount for you! As far as the dish size, I believe you’re supposed to measure across the top from inside edge to inside edge, and depth is measured going straight down with a ruler (as opposed to laying the ruler along an angled side). Can this dish be assembled early in the day and then baked just before serving? 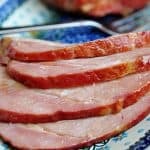 I stumbled upon this site while I was looking for a crock pot ham recipe. 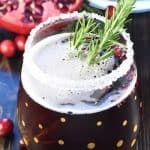 Wow- this is a treasure of recipes! I am going to share it with all my friends looking for new recipes and I can’t wait to try most of them :-). Keep up the good works Samantha! You are too sweet, Simone…thank you for your kind comment and for sharing the site with your friends. I hope you find a lot of recipes to try and that you enjoy them all! 🙂 Have a great week! Can this be made the day before, stored in the fridge, then baked the day of? I have a Christmas Eve dinner with one side of the family and a Christmas Day dinner with the other side. 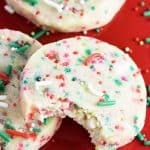 I would love to make this for both, but save time by making it all Christmas Eve morning! Thanks!! Hi Sarah! That’s a great question. 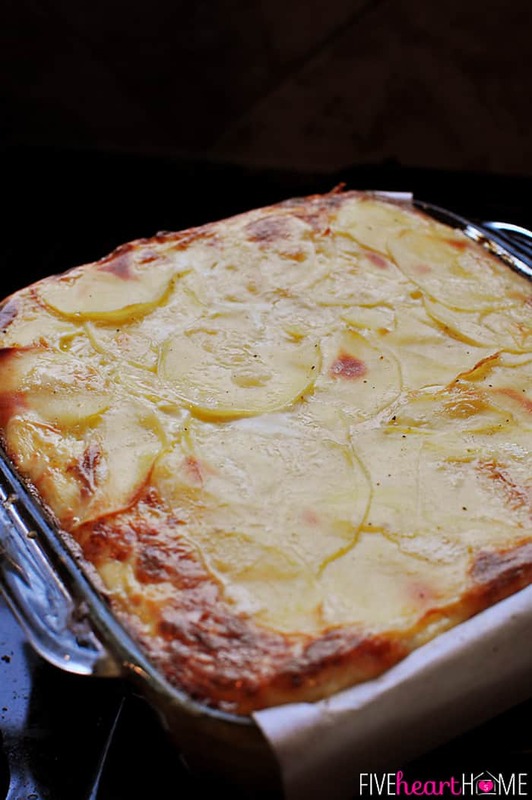 I haven’t tried it myself with this particular recipe, but I have made other variations of scalloped potatoes ahead of time and then baked them before serving. So I see no reason why that wouldn’t work just fine with this recipe! I would recommend taking the dish out of the refrigerator and letting it come to room temperature for awhile before baking it, though, since the potatoes will be chilled. Otherwise they might require a tad more baking time. Good luck, I hope everyone enjoys this dish, and I hope you have a wonderful Christmas! I’m so happy to hear that these potatoes were a success, Terri! 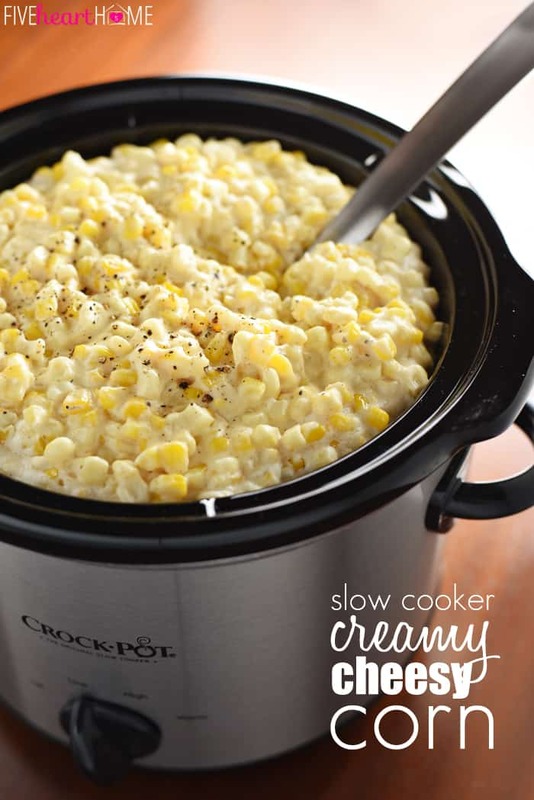 I agree that it’s a very rich, special occasion-type dish, but perfect for New Year’s Eve. 🙂 Your addition of chives and thyme sounds wonderful…I think I’ll add some fresh herbs as well the next time I make this! Thanks for coming back to let me know that this was a hit, and I hope your 2015 is off to a fantastic start! Any time I have made or eaten a potato gratin, no matter how much liquid or how long I bake them, the potatoes seem tough or under cooked. Somehow they never are tender. 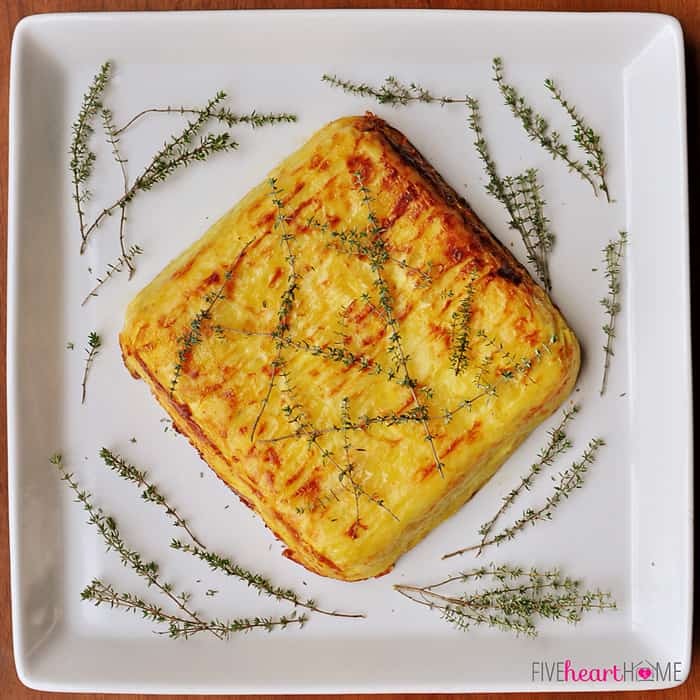 Does this potato flan have a tender and creamy consistency? Thank you.